Every year the English town of Pontefract in West Yorkshire celebrates its long-standing relationship with liquorice by holding an annual festival dedicated to this versatile plant. The Pontefract Liquorice Festival is usually held on the second Sunday of July. For 2017, the date is Sunday, July 9th. Look out for lots of street entertainers – magicians, circus performers – not to mention plenty of liquorice food and drink, as well as talks on the history of liquorice and many food, craft and gift stalls from around the region. Given that liquorice plants normally flourish in much warmer climes it is strange that Pontefract has had such a very long association with it. It was the Crusaders who brought the plant – Glycyrrhiza glabra, a purple and white flowering perennial – from Turkey, Spain, Greece and Asia, and introduced it to the town in the 15th century. In addition to requiring subtropical temperatures, it also needs good, rich soil and is difficult to grow. Although the northern town of Pontefract could hardly be described as subtropical, its heavy clay soil provided the necessary nutrients for the root to thrive. Dominican monks began to cultivate it in the priory gardens for use in herbal medicines, but monks in other English towns were unsuccessful in their attempts to grow it. Apart from its use as a sweet flavouring – it is 50 times sweeter than sugar cane – liquorice has long been recognised as having medicinal properties. There are records of it being used by many ancient civilisations, such as in Mesopotamia, Egypt (it was among the “luggage” plants found in the tomb of Tutankhamen in 1350BC), Rome and China. 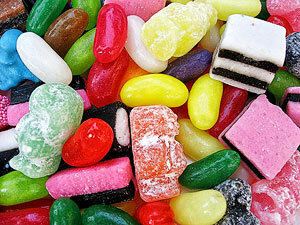 During the 14th century Chaucer wrote of people using liquorice to sweeten their breath. Since then, it has been used to soothe coughs and bronchitis. It is still one of the ingredients often used in cough medicines and lozenges. Described by the Encyclopaedia of Spices as “medicinal and highly aromatic,” its strong smell and taste mask other, less palatable, flavours. Liquorice has also been shown to alleviate the discomfort caused by some stomach ulcers, and its anti-inflammatory properties make it useful in easing the pain of arthritis. In Japan it is used to help with problems of the liver such as hepatitis and cirrhosis. It can also act as a mild laxative and, as cigarettes are flavoured with liquorice, it can be used as an aid for people who are trying to give up smoking. It is even reputed to be aphrodisiac – the Kama Sutra has a number of recipes containing liquorice to increase sexual vigour. The plant is related to the pea family and stands about five feet tall. The most common variety is the Spanish, with blue flowers; the less common Russian one has lilac blossoms. The bush needs to be grown in long trenches in order to accommodate its extensive roots. These are harvested after three to five years, then dried, after which they can be kept indefinitely to be sliced or ground into powder or made into concentrated sticks of essence which can be dissolved in water. Any reader of Richmal Compton’s “Just William” stories will be familiar with “liquorice water.” More familiar, and more palatable, drinks flavoured with liquorice root include sambuca and Guinness. In the latter, liquorice is also used as an emulsifier to help create the creamy foam on top. English-grown liquorice is harvested in late autumn and, rather than being dried, is sold fresh for making extract. The fresh English variety is said to have a more delicate flavour than the imported and is perfect for making candy and confectionary. Among its other culinary uses are flavouring ice cream and bread. I even came across a recipe for “turbot with liquorice” recently. The “cakes” made in Pontefract are actually small discs of liquorice sweetened with sugar. They often come stamped with a picture of Pontefract’s castle to commemorate the fact that they were first made in 1760 at the Old Castle Inn, kept at the time by Richard Dunhill. After his death, in 1845, the Dunhill family went on to make Pontefract cakes, along with other, now famous, liquorice sweets. One day, or so the story goes, a travelling salesman had an accident in his van while delivering Dunhill’s liquorice sweets. As a result, they became mixed up. On being asked by the shopkeeper what he had to sell, he replied: “All sorts by the look of it.” That is how the name liquorice allsorts was born and the rest, as they say, is history. In 1994 Haribo (the German company that produced the liquorice wheels that some of us remember from our childhoods) bought the business in Pontefract, where today there are still two factories. So the town’s long association with liquorice continues to flourish and is celebrated annually. Nathan James is a traveller with a sweet tooth, and finds plenty of opportunities to satisfy his cravings at Gumball.com, especially with their bulk candy (they sell machines for vending sweets too). hi, my family and i have been visiting the liquorice festival, for a few years now. We love all aspects of it, from the street entertainers to the traders stalls, the animals, the live shows, all fantastic!. We always have lunch in one of the pubs, and tea and cakes in one of the cafes, a great day. We travel from the east coast, using the m62 , only an hours drive. Enjoyed reading the info above to do with the history of liquorice. We will be there this year, and telling our friends, and relatives about pontefract day out. Hi Steve, thanks for sharing your love of the Pontefract festival. As someone who loves liquorice, I envy you for being able to join in the festival fun every year. We wish the Green family a great time at this year’s festival. Feel free to come back and share what you enjoyed most of this year’s festival.